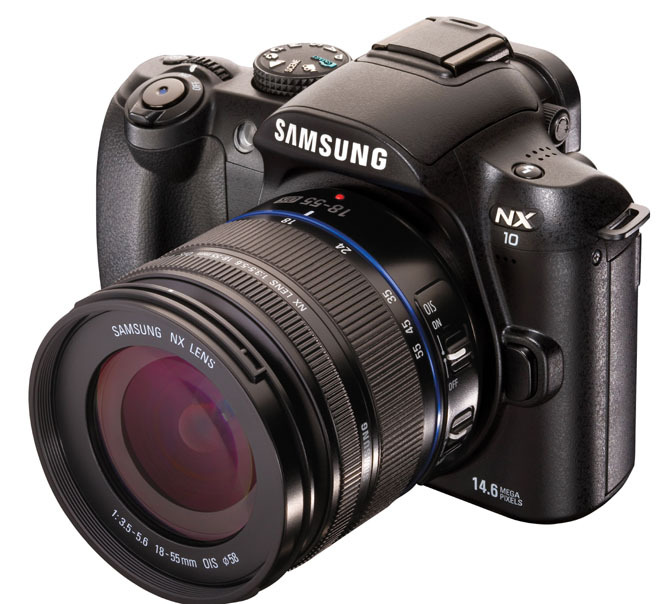 Samsung has announced its new NX10 camera, which the company is billing as a hybrid camera with the “heart of a DSLR” packed into a frame not much larger than a compact digital camera. And the NX10 seems to be backing the specs to back up some of that claim, with a 14.6 megapixel resolution, an APS-C size CMOS sensor, a 3-inch AMOLED display, HD video capability, a new DRIMe II Pro image processing engine…and the ability to use those interchangeable lenses the DSLR crowd so love. What’s missing? The optical mirrors at the heart of a DSLR system. In addition to cutting down on the bulk of a DSLR system, the NX10 has a bundle of features aimed at amateur and aspiring photographers, including a Smart Auto function, a built-in pop-flash, a Smart Range contrast enhancement feature, and an integrated dust reduction system. The AMOLED display provides easier viewing in bright sunlight, and has lower power consumption than LCD displays—the camera cuts power usage even more by automatically detecting when a user holds the camera to their eye, and shuts down the display. For the pros, the NX10 features a Samsung NX mount for interchangeable lenses (which, yes, means lenses photographers have on-hand can’t work), in-depth manual controls, image capture all the way down to ISO 3200, and optical image stabilization. 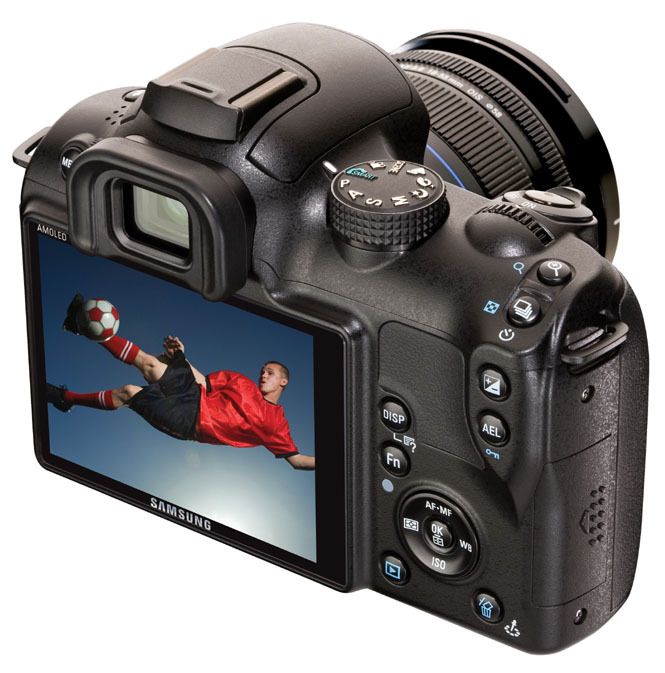 The camera will also shoot H.264 HD video, and users can push those out to a big screen via HDMI. Overall, the NX10 isn’t as small as Micro Four Thirds cameras already on the market—the body weighs about 0.75 pounds (without battery!) and it’s over 1.5 inches deep—and the inability to use existing lenses may be a serious issue. But Samsung could make up some ground when it announces pricing. The company is showing the camera this week at CES, and expects it to be on sale during “spring” of 2010: in marketing-speak, that means before late June, so Samsung has some time to decide how much it wants to charge for the NX10.